Also referred to as “liquidation,” “straight,” “total” or “fresh start” bankruptcy, Chapter 7 allows people to wipe away much of their outstanding debt and essentially start over when it comes to their finances. Not everyone, however, can qualify to file for Chapter 7 bankruptcy. In order to qualify for Chapter 7 bankruptcy, your income cannot be over a set amount determined by Illinois. If your income is above this set amount, you may be better suited for a debt reorganization bankruptcy. You must also take a credit counseling course prior to filing for bankruptcy, as well as a financial course after filing. Our bankruptcy lawyers put their extensive experience and knowledge to the benefit of our clients every day. It is how we have become a leading Chapter 7 bankruptcy law firm in Chicago, Illinois, has helped over 50,000 people get out from overwhelming debt. Contact our offices online or call 312-853-0200 to schedule an appointment to speak with an attorney. We are ready to help. We are the BillBusters, we’ll get them to stop! As in all bankruptcy cases, the filing of a Chapter 7 case usually triggers immediate court protection known as the “automatic stay.” It means that most collection actions, such as lawsuits, judgments, garnishments, and harassment against the debtor, must stop. Chapter 7 is often called “liquidation” bankruptcy, or “fresh,” “straight” or “total” bankruptcy. In Chapter 7, The law allows you to keep some of your property such as a home, cars, household goods, clothing etc. within certain limits, called exemptions, and the bankruptcy trustee may sell any assets above those limits to pay your debt. Most people file Chapter 7 because they don’t have any assets above those limits, so there is no actual liquidation in such “no-asset” cases. 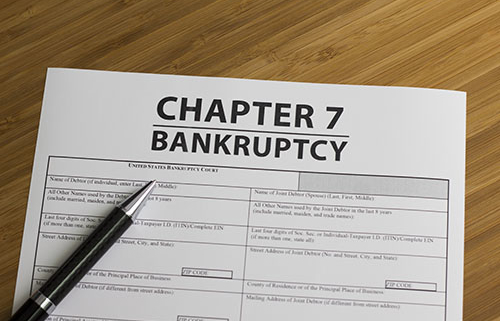 Chapter 7 is nice and fast-if all goes well, the bankruptcy court typically will issue an order, called discharge, a couple of months after you filed your petition, legally forgiving any of your debt that can be forgiven. Chapter 7 is ideal for people who owe a large amount of unsecured debt such as credit cards, medical bills, payday loans, and back utility bills without a lot of assets. If you have a car loan or mortgage that you feel you cannot afford to pay, you can also give up the car or house without owing anything. Filing Chapter 7 doesn’t necessarily mean that people will lose their homes or cars, so long as they can afford to maintain their payments on these. Consult an attorney for details. Any entity, including individuals and businesses, is eligible for Chapter 7 as long as the entity is not barred by law from doing so. Under certain circumstances, however, some debts may not be discharged, and some people may not be able to receive a general discharge. Consult an attorney to see any of those exceptions apply to you. As in all bankruptcy cases, filing of a Chapter 7 case usually triggers immediate court protection known as the “automatic stay.” It means that most collection actions, such as lawsuits, judgments, garnishments and harassment against the debtor, must stop. The court sends notices of the bankruptcy to all listed creditors. The case is assigned a federal judge and a bankruptcy trustee. The trustee’s primary job is to look for assets that are not exempt, take it over and sell it to pay the creditors. As previously stated, most cases are “no-asset” cases, where debtors get to keep their property. All debtors are required to attend a meeting of creditors. Creditors have the right to attend the meeting and ask the debtor questions, but creditors rarely show up. Typically, the debtor just meets with the trustee, who asks a few questions about the debtor’s debts, assets, income, expenses and financial affairs. If you elect to hire us to represent you, we will be with you at this meeting. After the meeting, the trustee either issues a no-asset report, meaning the trustee is finished with the case, or makes a finding of assets, in which case the trustee will pursue such assets for the benefit of the creditors. The Trustee may also simply continue the meeting in order to get more supporting documents or conduct an investigation as to the value of an asset. The trustee, U.S. Trustee and creditors have two months after the meeting of creditors to challenge a Chapter 7 case, if they feel they have the right to do so. In most cases, it does not happen. Once the deadline passes, the debtor is entitled to a discharge, and will receive it soon from the court by mail. A business, however, does not receive a Chapter 7 discharge. A debtor may not file two Chapter 7 cases within eight years.